In my post How Our Family of 5 Eats Healthy for $100 a Week I touched a little on how we cut back on our meat consumption not only to benefit the environment and our health but to also cut back on our grocery bill. Well, I wanted to really break it down and show just how big of an impact less meat can make. Not only are these frugal, healthy and hearty meals; they also leave you with plenty of leftovers and are fairly easy to prep. Yes, they will take some prep time and a few hours in the kitchen but it will also give you back all of your time during the week and make getting dinner on the table a quick, easy and less-stress-mess. 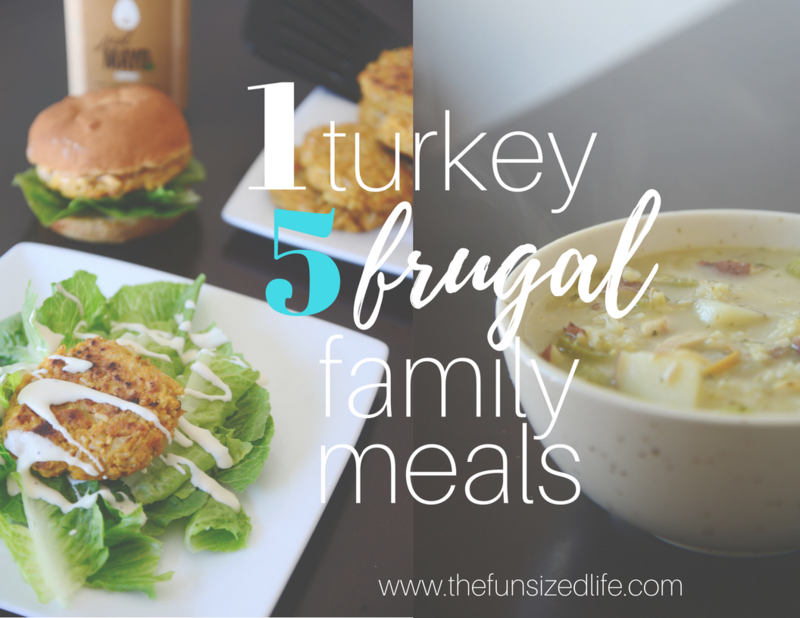 For even less-stress in the kitchen and at the grocery store check out the $5 Meal Plan Here is your guide to 5 frugal family meals to make with only one turkey! Take it easy on yourself with this first round. After you have a cooked turkey, have yourself some mashed potatoes, gravy and veggies to go along with it. The prepping part comes as you work your way into the leftovers. Make sure you save the gravy because it will come in handy later! After you have cut your turkey and chowed down with the fam, be sure to set the bones and skin aside to create some homemade bone broth. All this takes is a large crock pot (4-6 quarts.) Just place your turkey remnants in the crock pot, fill with water and you’re on your way. You can add onion, garlic, salt, pepper or any other flavorings of your choice. You can see my Asian bone broth recipe here: Asian Chicken Bone Broth Recipe. Allow the crock pot to sit on low for 6-8 hours. While you are waiting on your bone broth (which will take several hours) you can start prepping some of the necessities for your other meals. Start by cooking 2 cups of rice. You will use one cup for this recipe and the rest in the next. These turkey burgers are great when it comes to serious meal prepping because they make a ton and they are very universal; you can eat them plain, as a burger or my favorite, on top of a salad. For this recipe I chose to use sweet potatoes, you can of course make it easy on yourself and use any leftover mashed potatoes that you have from meal #1! Maybe toss in some corn along with it? This is definitely something you can play with to fit your needs. Personally, I have been trying to find fun ways to work with sweet potatoes because our family loves them so much, we usually buy them in bulk. For this recipe I also used the awesome gluten free pie crust recipe I discovered this past Thanksgiving. You can see the link along with the recipe. Meal #5: Turkey Taco Tuesdays! A final recipe you can use your turkey for is definitely the most popular way in our house: taco Tuesday style! Check out my Crock Pot Chicken Carnita Nachos and my Spicy Chicken and Pineapple Tacos. For these recipes, just swap out the chicken for your turkey and you have got yourself a seriously delicious Taco Tuesday going on. I am a big believer in meal prepping. See my method here: Whole Food Meal Prep. Meal prepping can give you so much time back into your life and with a good strategy in place you’ll find you can start saving some serious cash as well. If meal prepping is not something you’re very good at, consider a service like $5 Meal prep that take all the guess work out of planning your grocery list! 6 Step Meal Prep. How to Plan Healthy Meals for the Whole Family in One Day. Great recipes. I love it when you can make multiple meals. Saves time and money. That soup looks delicious! Perfect for when the weather is as cold as it’s been here in South Florida. This is great! Do you think a rotisserie chicken or even a whole chicken would work too? Absolutely! Might not get as much out of it…but it’s possible! These all look so delicious! I’m pinning so I can come back to this later! This is perfect, as I’m looking for ways to save money and more recipes to use at home. Thanks for sharing! Michelle, I’m so glad you found it helpful! This is an awesome post! I always have so much turkey left over after the holidays and I always make turkey soup with the left overs, but there is much to much left overs all the time. I love the idea of your turkey burgers. I can’t wait to add them to my list of meal prep ideas! Pinned!! I know! Turkey can start to feel a little endless after a while! The burgers are great because they make so many–you can freeze them if needed. The turkey burger ? and sweet potatoe turkey pot pies both sound great. I must try them both out. ahh I’m salivating! So down for the turkey burgers, the turkey soup and the turkey pot pie. we always have leftovers this time of year so it’s usually turkey salad and turkey wraps, and turkey sliders but I love all of your different ideas. I am sooo making that GF pot pie! Girl, love the meal prep but get yourself an instant pot! Lots of that meal prep can be done so much faster! YES! Don’t I know it! Meal prep done in 1/8 the time! Great ideas to stretch one ingredient! Thanks for sharing. Will have to try them out. Genius! All these recipes sound so delicious too. Thanks Rachel! They all turned out pretty great! My husband and I have started buying whole chickens and turkeys to save money, so this will DEFINITELY be a great post to reference for some meal ideas! Thanks for sharing! They really can stretch a long way! Great looking recipes! That soup is really calling my name 🙂 Thanks for sharing! Thanks so much Juanita! The soup was definitely my favorite with all the cold weather we’ve been having. oh my goodness, the turkey burgers look amazing – have definitely just printed that recipe haha! Thank you. Turkey always seems to be used up in a boring way so these are welcomed ideas! Great! I hope you enjoy them as much as we do! Thanks Hannah.